The Swiss work a 42-hour work week instead of the typical American 40-hour one (or the 35-hour one like the French). There’s a reason for this. It’s called thoroughness to the point of pointlessness. For example, requiring an entire office to attend a 3-hour printer training session that includes everything from learning where toner waste ends up to how a printer converts RGB color to CMYK. Despite this in-depth training, the following day, I needed to print something and couldn’t figure out how to turn the printer on because that wasn’t covered in the 3-hour session. I mean who wants to do something as simple as press an “on” button when you can analyze percentage of black toner use versus cyan? 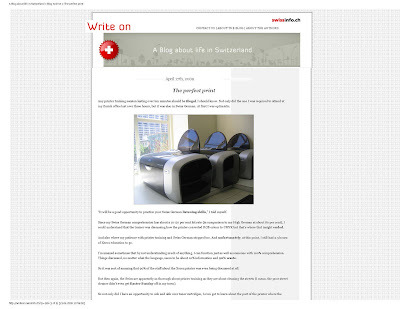 For more on the wonderful world of Swiss office life, visit this week’s Write On post, “The Perfect Print,” on swissinfo.ch. I thought in Europe they worked less - and tooks lots more vacation. They do take lots more vacation. But they also spend countless hours processing for example, my yearly residence permit, which takes 4 months to renew each year. I want the 40 hour American work week! Where do I sign up? Same culture in Asian countries like Singapore, HK and Japan. Example I work as property agent for the upcoming project trilive at kovan in Singapore we work really hard to make sure all beautiful units are sold! Thanks for sharing this post, I am also checking out some wonderful Swiss offices. I've been doing some free agent stuff lately and I've learned a lot from reading some of your post Chantal. Swiss office is almost similar as the one in Singapore specially this new condo in Sengkang Singapore.